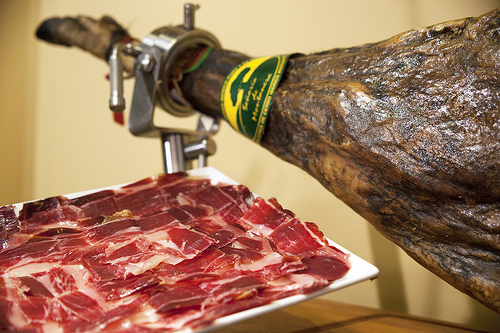 Iberico ham tasting has become a feature of competitions all around the world. In turn this has facilitated the emergence of professional tasters whose skillful palates and knowledgable descriptions have formed the basis for learning how to enjoy the organoleptic (sensory) qualities of Iberico ham to the utmost. At the end of the long, laborious process of breeding, rearing, fattening and slaughtering Iberico pigs and the skilled traditional craftsmanship that goes into every ham, there's the reason for it all: Iberico ham tasting. This will help to establish the value of the batch of hams and so it's a vital consideration of the producer, but it also has cultural value. 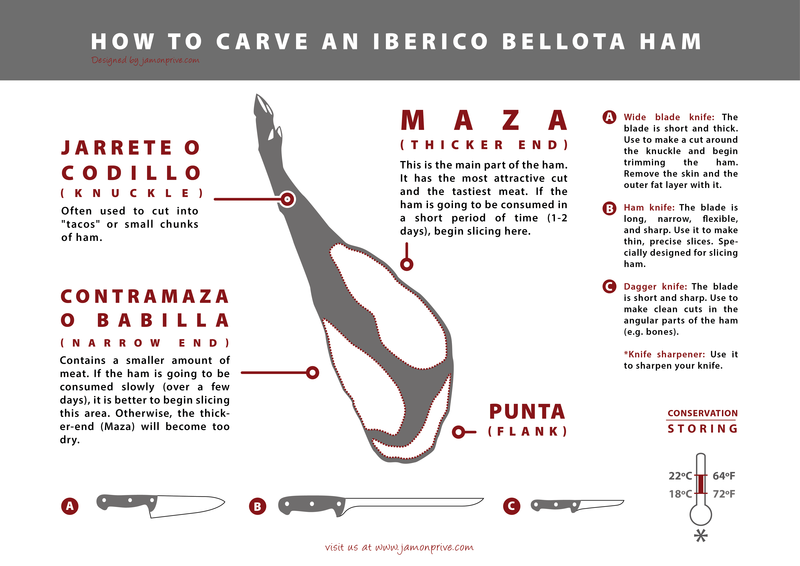 If you're interested in really getting the best out of your Iberico ham, it's a good idea to have at least a basic idea of the language and phrases used, so you can take full advantage of your senses and capture every nuance! Sight is the first sense that is involved in the tasting of an Iberico ham. We can observe and discern by its shape alone if we have a quality ham: is it elongated? Does ity have a dark hoof? Is it slim-boned? Is there some mold and a grayish exterior? All these go to reassure us that we have a top-notch ham before us, one that will be a treat for all our senses. Therefore, tasters pay a lot of attention to the appearance of the piece. 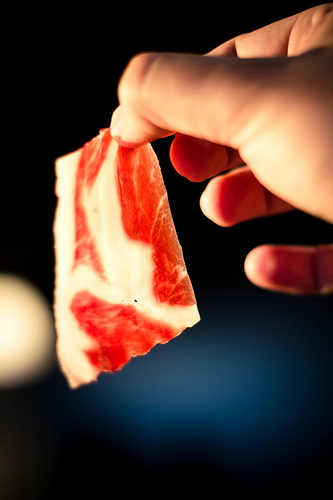 Once you begin peeling the Spanish ham, you can see the first layer of yellowish fat, a result of the curing process. As you begin to prepare the piece for slicing, you can see a lot of white fat attached to the muscles themselves, which owes its presence to the "montanera" (mountainside) feeding regime and is a clear sign of quality. If the tone of this fat is pink, then we're not just looking at any Spanish ham, but the very best of the best. The lean flesh of the ham also suggests many good things. Usually a good ham will have an intense bright red or pink color, because of the effect of the intramuscular fat and the crystallization of amino acids on the flesh. When tasting Iberico hams, experts ensure that they are able to pick up on the nuances of taste that give a special personality to the Iberico ham. We can refer especially to the recently discovered sixth taste, "Umami" which literally means "deliciousness" but refers to the rich, savory flavor we associate with great meat products. Sight is the first sense that is involved in tasting Iberico ham. 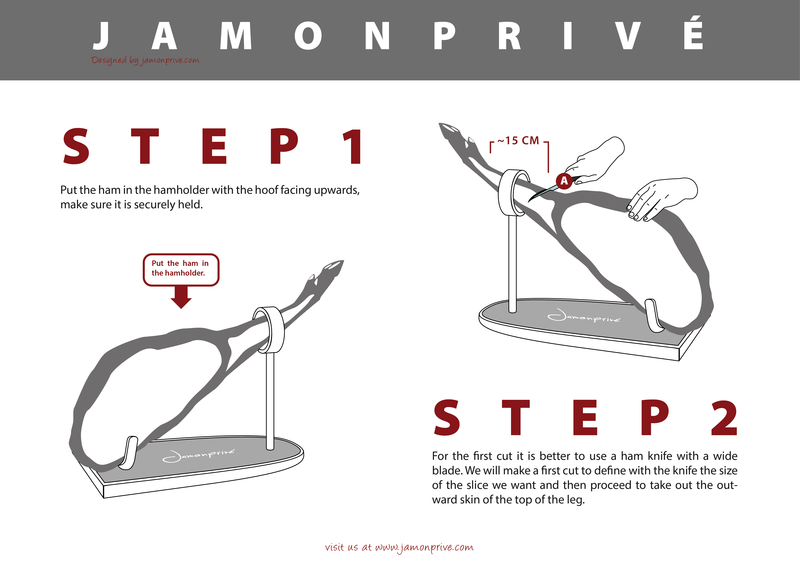 We can observe and discern immediately if we have a quality Iberico ham, based on shape alone. We're specifically looking for a ham that's elongated, with a black or dark hoof, somewhat thin bones and some superficial mold. These are all signs that we're looking at a really great ham. Without doubt, expert tasters pay attention to the appearance of hams like this. Once you begin to open the Spanish ham, you can see a thin layer of yellowish fat due to the curing process. As you begin to prepare the piece for slicing, you'll see a lot of white fat attached to the muscles, the result of the acorn-based "Montanera" (mountainside) feeding regime. If this fat has a pink appearance, we can be sure that we are holding a Spanish ham of the very highest quality. The appearance of the lean flesh also has a story to tell us. Usually, a good Spanish ham has pinkish or red flesh, because of the action of the intramuscular fat. We can also observe crystalized amino acids deposited on the lean meat. Tasters work to ensure that they are able to appreciate all the subtle nuances of an Iberico ham, including the discovered "Umami" flavor, which we find in rich tasting meat products. The next phase of tasting Iberico ham takes place in our noses: the aroma of the ham tells us much about it and is a pleasure in its own right. Factors that result in a great scent from an Iberico ham include time and environmental factors involved in the curing process as well as the breed of pig and the "Montanera" feeding regime. Another very important point is the saltiness of the ham. If this is balanced, we will have a ham with a more nuanced flavor that isn't overwhelmed by the salt. Lower salt content also tends to produce a better, juicier texture. Our pleasure at the flavor of a great Spanish ham is great but it must not be allowed to overwhelm our critical faculties if we're to fully enjoy it: much of the pleasure of a great ham is in the nuances. We also need to remember to pay attention to the texture of the ham, even as the flavor competes for our attention. First, we look for juiciness, which is the result of a balanced fat and salt content. By contrast, Spanish ham tends to dryness if the ham has been cured for too long a time, and the upper part is typically dryer than the lower part anyway. Finally we should think of the amount of fiber in the ham. A high-quality Spanish ham will tend to be less fibrous, less chewy, and will often have a smoother texture. There's another matter taking place on the palate. At the same time as you're assessing the texture, you're discovering the taste. Very salty hams are one-trick ponies: that's all you can taste. But with a good Iberico ham, there's a wave of subtle flavors including sweetness and Umami, all interrelated. “Bellota”, or "acorn": At room temperature, you can taste a flavor of acorns in the meat. “Salado”, or "salty": As mentioned above, this is regarded as a positive attribute as part of a balanced flavor, but a negative one when it's overwhelming. “Dulce”, or "sweet": A very particular flavor that is often found in hams that have been hung for long periods in cellars according to traditional methods. “Picante”, or "spicy": this flavor should present itself in moderation, so as not to overwhelm the rest of the ham. Spiciness is often found to appear to accelerate the curing process. “Rancio”, "rancidity": in very small quantities is considered by some to be an interesting note, adding interest to a ham, but in large quantities is regarded as the lowest to of tasting notes. In general, notes that are considered positive for hams include burnt sugar, hints of wine, flavors of nuts like acorns, walnuts or hazelnuts, and negative flavors are usually said to include mustiness, fishy flavors, or excessive moistness.